To Ara on the "Ships starting with A" page. Delivered in Aug.-1919 from Trosvik Mek. Verksted, Brevik as cargo vessel Bois to D/S A/S Bois (Harald Hansen), Skien, 196.9’ x 32.5’ x 12.4’, 966 gt, 1254 tdwt, Triple Expansion (Akers) 126nhp, 9.25 knots. 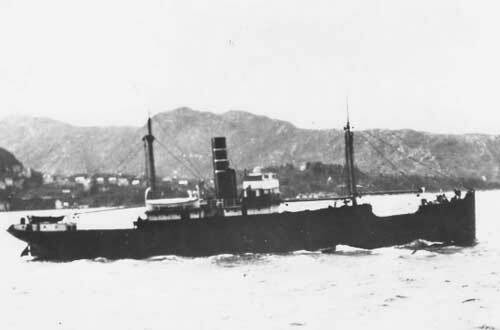 Purchased by Bergenske D/S in Dec.-1921, renamed Ara and used in the company's cargo lines. By the summer of 1939 she was in the company's Trondheim-Bergen-Dunkerque-Bordeaux route together with owner's Delfinus. Follow the convoy links provided for more information on them. Erros may exist (this could also mean that she may not have sailed in all the convoys mentioned here), and several voyages are missing. Again, see also Page 2. (Page 5 gives arrival Liverpool, Febr. 20). Further 1942 voyages are shown on Page 6, Page 7, Page 8 and Page 9. The latter document also has some 1943 voyages, while the rest are listed on Page 10, Page 11 and Page 12. With a cargo of fresh fish and mails for Newcastle, Ara is listed as sailing in Convoy HN 22 from Norway to the U.K. at the end of March-1940, thereby ending up in allied service throughout the war. Follow the link for more details; several Norwegian ships took part. Judging from the information found on Page 1 of the archive documents, the intention had been to return to Bergen, but of course, she did not (Norway was invaded Apr. 9). It'll also be noticed that she spent quite a long time at Shields (Tyne) that spring. In Sept.-1940 she shows up, with no voyage information, in Convoy OA 210, which left Methil on Sept. 6 and dispersed on the 10th. From Page 1, we learn that she arrived Greenock that same day. The Norwegian Tautra is also included - ref. external link provided within the Voyage Record (incomplete listing). It'll be noticed, when going to the various archive documents, that she occasionally had long stays in port. According to the Stavern Memorial (link at the end of this page), there was an accident on board on Jan 4-1943 in which Seaman Lars E. Toranger died when working on a lifeboat. Ara was on her way from Southend to Methil Roads and Leith on that date (see Page 9). As can be seen on Page 19, Ara got to go home to a free Bergen already in July-1945, making several more voyages home before that year was over. In fact, it looks like Christmas of 1945 was celebrated while in Norway. The document also shows a few of her 1946 voyages. Sold in July-1948 to A. F. Bjørnstads Rederi A/S, Tvedestrand, renamed Bjørnvik. Laid up in Antwerp in the fall of 1949. Sold in Aug.-1950 to Skips-AS Motor (E. Salvesen), Kragerø, renamed Rim (this was a forced sale). Sold in Febr.-1951 to D/S A/S Vivi & D/S A/S Asta (Clemeth Dann), Oslo, renamed Sjofna. Sold in Oct.-1953 to Everest Cia. Mar. SA, Panama, renamed Panagis. Renamed Lucia in 1955. Possibly involved in a collision in 1957? Broken up in Greece in the winter of 1958. Stavern Memorial commemoration - Lars E. Toranger, mentioned above, is commemorated. Back to Ara on the "Ships starting with A" page. The text on this page was compiled with the help of: Misc. sources, including pre war and post war info received from T. Eriksen, Norway (his source: Articles by Dag Bakka Jr. about Bergenske D/S in the Norwegian magazine "Skipet", 1-2.88).